Perhaps it was just as well that I had a frugal January, which was quiet and without incident, seeing as February was almost the opposite, though it was a mix of good and not-so-good. Several social outings with friends did the world of good to banish away some January blues! Work has been manic but manageable – the leadership team were over from the US, and my colleague and I were described as a ‘Dream Team’ – hope they remember that when they’re dishing out the pay rises, haha! I received a surprise letter from a building society regarding a ‘failed’ PPI claim I’d made last year, which advised me that following the FCA’s updated regulations, I was actually entitled to payout so I received £74.40 – thanks very much! Then, it was another month, another premium bond win, with £25 going into the pot with the other winnings! Also, I kicked off my home brewing again as I had a ‘window of opportunity’ before work on my kitchen is finally completed. I’d forgotten how much effort it all takes but it was an enjoyable kind of effort and my kitchen smells like brewers hops now! A full update once I have a (hopefully) nice IPA to sample! Chinese New Year came and went with its usual associated family expenses which were (mostly) budgeted for. May the Year of the Dog be a happy, prosperous and lucky one for all! That first cold snap we had in the month, my boiler broke down so I was without heating and only intermittent hot water for 3 days. Fortunately, I still had the use of a gas fire, made the most of the shower facilities in my gym, plus the call out and subsequent repair was covered by my boiler plan. Next, my PC of 8 years decided to break down. I spent 3 days trying to fix it myself (via youtube vids) but as I didn’t want to make the problem any worse, I had to call in an expert. The repair and replacement hardware took a chunk out of my emergency fund but it’s all running like new again so here’s to another 8 years. So, how did I get on with my savings this month? Ok, I saved 43% – not as bad as I thought it was going to be if I’m honest. My average savings rate now drops to 51.2%. As I’ll be booking my holiday in the next month or so (which may turn into a ‘holiday within a holiday’), I’ll just need to keep a cap on some other spending over the next couple of months so my average doesn’t drop too much, though I won’t go full-out frugal again like last month (too soon!). I started investing in Scottish Investment Trust this month, for more diversification. The news in February was all about the crisis – I’m talking stock market, not KFC chicken, haha – which I pretty much ignored at the time. 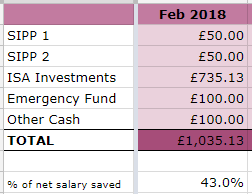 What I do know is that at the end of the month, my Future Fund stands at £132,249 – yes, it’s gone down a bit from last month, but in line with my long-term plan, I’ll just continue investing as normal. 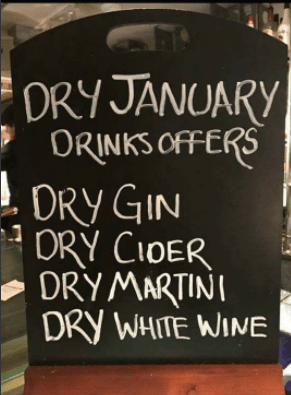 Anyone do ‘Dry January’? Although some of my friends and family did, I didn’t bother. Since I don’t drink during the week, I see little point in depriving myself at weekends. Apparently, my sister failed on day THREE, haha! Anyway, this month I tried to lead a frugal nun-like existence. That meant turning down social events, no eating out/takeaways (massive assumption here that nuns don’t have social events, eat out or have takeaways…). My only purchases were basic groceries (including necessary toiletries), a gift voucher (for nephew’s birthday), stamps and a pair of socks. No January sales for me. Packed lunches for work, except for perhaps on 4 occasions where I spent less than £2 on my lunch. On the one hand, it felt great knowing that I was going to save more of my salary this month. On the other, the frugal existence didn’t make me feel too happy and in the end, to preserve my sanity, I succumbed and forked out to see the latest Star Wars film at the cinema. I think I already have my expenses and spending down to a decent level allowing me to save/invest whilst enjoying life – there was probably no need for me to do a frugal January but I thought I’d try it anyway. I have to say it’s not something I’ll be attempting again in a hurry, not to this extreme. So, did my being very frugal affect how I much I saved in the first month of the year? Yes, because I saved 59.3% – it could have been more if I didn’t have some December expenses on my credit card bill. I know, I know…imagine if I could do this every month! But no, living like this isn’t something I would choose to do long-term, even knowing that it would help me achieve my goals quicker. I guess I’m just not in that much of a rush! The above savings include my £25 Premium Bonds win, £16.32 from TopCashback*, £63.22 from Google Adsense (my annual payout! ), £71.16 affiliate income from OddsMonkey, £130 matched betting profits, and £50 rent received. I started investing in Witan Pacific IT this month, for some diversification. The rise of sterling and small wobbles in the market caused my Future Fund to stay pretty much the same at £133,045, despite the capital injection this month. Whatever, I’m just going to continue investing anyway. I don’t remember finding the subject of Economics very interesting at school, or particularly after school, if I’m honest. 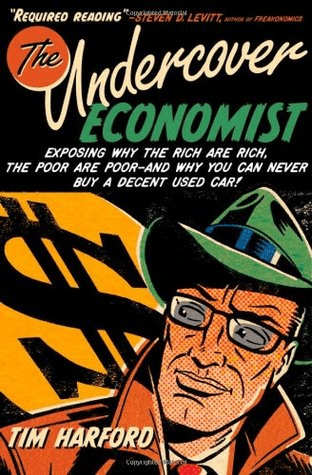 However, I did enjoy the type of ‘economics’ as found in the Freakonomics books, and one of the ‘you might also like’ suggestions in Amazon came up with The Undercover Economist by Tim Harford. This became the final non-fiction book I read in 2017 to achieve one of my goals. The book occasionally got a bit too much like a school text book but all in all, mostly held my attention. It was very much educational but in an engaging way; things I learned included the ‘scarcity power’ of retailers pushing up prices, how and why ‘externality pricing’ works’ (eg congestion charges) and ‘auction theory’, where the example used was the UK’s 2000 telecoms/spectrum auction which became the biggest auction ever (at the time), plus an insight as to why sweatshops might not always be the worst thing for employees. For those who love their takeaway coffee, there’s a chapter called ‘Who pays for your coffee?’ with interesting examples of how coffees/drinks are priced. I was interested in the history of how China started its latest revolution to conquer the world, although as the edition of the book I was reading was written in 2006, it doesn’t include China’s explosion in the last 10 years. However, even 11 years ago, China’s growth was spiralling upwards like a rocket. Having never heard of Harford previously, I now see him everywhere doing a couple of podcasts (interesting one here about fake news or ‘facts’ which mislead), plus there was even an article by him in the British Airways magazine I was reading on the plane during my recent trip to London! I’ve probably just never noticed him or his work before, but I’ll be paying more attention now. An interesting read in any case and I would definitely read some of his other books. I’ve been using my local library since the mid-1990s, when I moved back home to Manchester from uni. Around 12 years ago, my library was at risk of closure due to council cuts – fortunately, it was saved and I started to use it more often, with a ‘use it or lose it’ view. Borrowing books also helped me reduce my spending as I no longer felt the need to buy new books. I was extremely relieved to hear that the library once again escaped the ‘chop’ and that it was not to be one of ten libraries (yes 10!) which were closed by the council earlier this month. Very sad times and those communities will be all the more poorer for not having local library facilities. Although my library has been saved, the hours of opening have been severely reduced and I can only feel for the staff who have worked there for many years and the people who regularly rely on using library facilities. I wonder if Tim Harford has a theory on how libraries can be saved or run more efficiently? And finally, a good start to the year with my first Premium Bond win of 2018 – just the £25 but it all adds up! I hope to get many more wins over the year. Blogging’s going on hold for a bit as I’m off on hols to Hong Kong (for around three weeks). My holidays are all budgeted for, although this particular one is going to blow my budget… we’ll see anyway! I’m really looking forward to the break as I’ve not had a single day off since I returned to work in May and as we all know, weekends just aren’t enough so my brain is a little fried! As usual, I’m stressing a little (I always do before I go away) but once I’m on that plane, I’ll be fine! Can’t wait to catch up with the family and also to soak up some rays and warm weather, hopefully get rid of some of these winter blues! 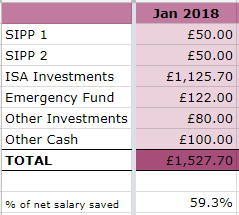 November’s savings and numbers update will likely not appear until the second week of December, assuming I get myself semi-organised upon my return! I’ll catch up on my reading and comments when I get back. 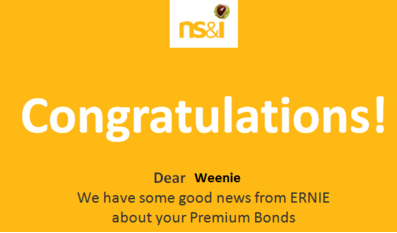 Anyway, I’ll end this brief update with the news that I got another Premium Bond win – yay! Just a £25 prize but better than nowt! My Premium Bonds represent the small (10%) cash element of my portfolio, not likely to earn much in the long run (although I live in hope!) but safe and stable (strong and stable??) compared to the rest of my portfolio, which is pretty much all in equities. 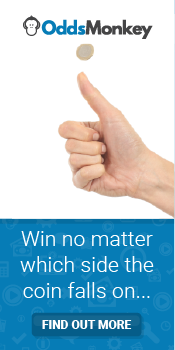 Here’s to more wins!